THE VILLAGES we know today as Binfield Heath and Crowsley once belonged to the ‘Hundred’ of Binfield, together with neighbouring Shiplake, Henley, Caversham, Wyfold, Rotherfield Greys, Peppard, Sonning Common, Kidmore End and Mapledurham. Introduced in Saxon times, Hundreds were sub-divisions of a county for the administration of civil justice. Invading Saxon territory in the 9th century, legend has it that the Vikings came up the Thames as far as Shiplake. As houses were built around the small settlements away from the river, the majority of the old boundaries radiated like spokes in a wheel from the Thames up to higher ground. The old parish of Shiplake followed the Anglo-Saxon manorial division of lands in South Oxfordshire, with strips rising from the river frontage through water meadows to the higher woodlands, stretching almost to Sonning Common. Binfield Heath takes its name from the Saxon hundred of Binfield to which it belonged, along with much of the locality. The name Binfield itself derives from Benifeld, noted in 1176 with later variant spellings, and may come from an original Beonan field, ‘a field belonging to Beona’. Because of the poor quality of land in this area it was left as heath, roughly in the centre of what is now the village. The heath was originally common land, lying between what is now Dunsden Way, Gravel Road, Emmer Green Road and Common Lane. The heath had four gates leading onto it, one each at the Bottle & Glass, the New Inn, the Coach and Horses (both now private houses) and Coppid Cross Roads. Local inhabitants had the right to pasture their animals on it. Up to the late 18th century, there were only two roads of any importance, one from Reading through Emmer Green to Henley and the second from Shiplake Mill via the church through Shiplake Row across the heath and on to Shiplake Bottom (Sonning Common) via Crowsley. These two roads crossed near Coppid Hall. 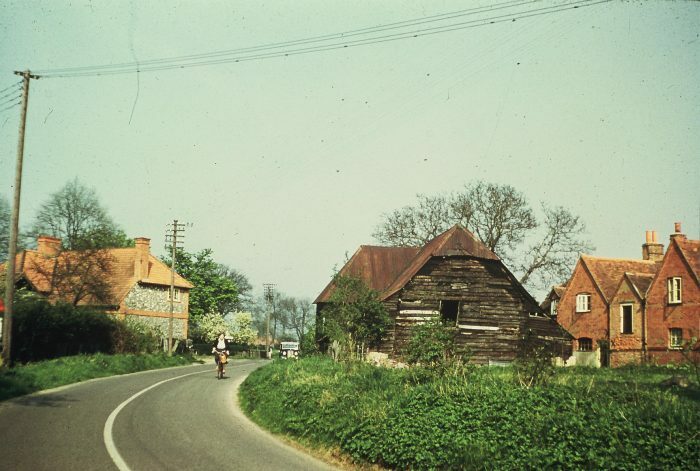 Small communities developed along the road at Shiplake Row in Binfield Heath and at Crowsley. This route provided the only road access to Shiplake until the present A4155 was constructed in 1769. The focus shifted from Shiplake Row once the Great Western Railway was constructed and land was sold by the Lashbrook and Bolney estates for house building in Shiplake at the turn of the century. Shiplake Row gradually became part of Binfield Heath, its history and origins enshrined in its name. Until the late 18th century the heath carried the main routes through from Peppard to Shiplake and from Reading to Henley. The village became a useful through-route and has always boasted plenty of welcoming watering holes – two of an original five still exist today. In 1867 the enclosure of the common land or heath was initiated principally by the Baskerville family of Crowsley. This was in return for the transfer of two areas of land by Coppid Cross Roads, one area for allotments for the ‘working poor’ and another area of land for recreation, together with various fencing and ditching and the construction of a new road (now Common Lane) from the Bottle and Glass pub to Arch Hill. Subsequently the whole heath, which was poor, gorse-covered agricultural land, and some surrounding farmland passed to the Phillimore family of Coppid Hall. The centre of the old heath is still mainly farmland and woodland. Binfield Heath Parish Council was formed in 2003: one of the first new civil parishes to be created in the new millennium. Previously, one third of Binfield Heath had been in Eye & Dunsden parish and the other two-thirds in Shiplake. A referendum of residents, held by the Boundary Commission, showed a large majority of people in favour of uniting the village and running their own affairs. The new civil parish was created, taking in the whole of the village, together with the hamlet of Crowsley. Linked by history, landscape, church, school and community, all these villages have always been, and will continue to be, closely intertwined.